Angela Sangha and Katie Hogan, founding teachers of the Social Justice High School (SOJO) who were fired on 8/24 as part of CPS’s move to dismantle the school, won back their jobs on 8/30. This is a huge victory – thanks to the strength of the parents, students, teachers and the CTU. Today, SOJO students, chanting “Where’s the Justice in Social justice” and wearing T- shirts saying “CPS We Want Answers,” led a disciplined march and rally of 200 in the community and another rally at the school. Parents marched with them in support. This is another move by CPS to destabilize and disinvest in neighborhood schools, disenfranchise the community, and turn public schools over to private operators. CPS is talking about taking half of the public schools in Chicago and turning them over to private operators in the next few years. The Chicago Tribune Editorial Board states, “CPS will likely close or consolidate scores of schools next year” (8/31). We have to draw a line in the sand. Tell them you want all the demands met! Join the Chicago Teachers Union and labor allies Monday, Sept 3rd in Daley Plaza from 10:30am-12:30pm for a Labor Day Rally for Jobs, Dignity and a Fair Contract! A SoJo HS Parent speaks during the public comment portion of the community forum. In a show of community unity, on Thurs. night Aug 23, 200 parents, teachers, students, and community members at Chicago's Social Justice High School (Sojo) denounced CPS-appointed interim principal and CPS Network staff for cutting AP classes and critical student programs, displacing core veteran teachers, disrespecting parents and community, destabilizing the school, and violating the values of the Hunger Strike that founded the school. Charging that CPS is trying to cut out the heart of Sojo's social justice mission, students led the parents and community members in chanting "where's the justice in social justice?" At the end of the day on Friday, Aug. 24, the interim principal fired Angela Sangha and Katie Hogan, two veteran English teachers who have been with Sojo since the day it opened in Fall 2005. 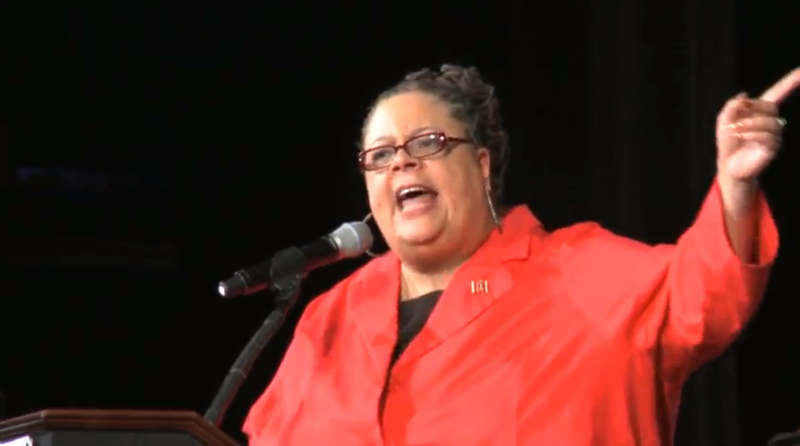 Parents, community members, students and teachers, backed by the CTU, are fighting back. Students are organizing to leaflet the community, starting Saturday (Aug 25). They need copying donated to distribute 1500 two-sided flyers. IF YOU CAN MAKE COPIES EMAIL TSJ ASAP. Stay tuned for next steps. Born out of struggle and the struggle continues! Check out article in Substance magazine on the meeting last night here. For more information, please download this flyer. Sojo was “born out of struggle” in 2001 when 14 Little Village residents endured a 19- day hunger strike to fight for a new school in their neighborhood. In Fall 2005, Sojo and three other small schools opened in a new building on 31st and Kostner, serving Little Village and North Lawndale. Sojo is a neighborhood school built on the principles of the Hunger Strike: “truth and transparency, struggle and sacrifice, ownership and agency, and collective and community power”. 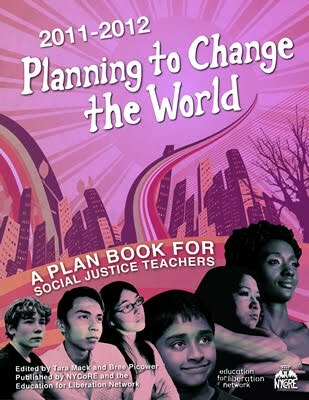 It is a national model of social justice education. But now, Sojo is under attack by the CPS Administration. CPS is trying to dismantle Sojo by downgrading the curriculum, displacing teachers, and lying to the community. Sojo’s very existence as a neighborhood public school serving low-income African American and Latin@ students with the vision of community self-determination is a threat to CPS’s top-down corporate model of schooling. CPS never gave a contract to the new Sojo principal, Kathy Farr, who was selected by the Advisory LSC and started in March 2012. On Tuesday, August 7th, just six days before school began, CPS fired and replaced her with an interim principal, without consulting anyone in the Sojo community. When school opened Monday, the interim principal cut three AP classes and replaced them with remedial classes, fired two attendance clerks, and reassigned teachers to classes and subjects with no preparation. On Day #3 of school, students organized a peaceful, disciplined sit-in to demand the reinstatement of AP classes and staff to their original positions. Now student leaders are threatened with explusion. 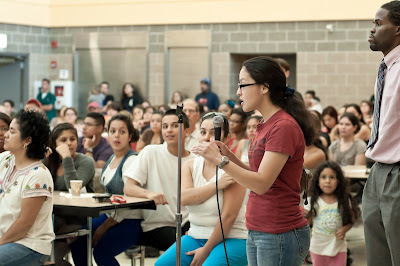 Sojo is striving for the critical and culturally relevant education our youth need. From Tucson to Sojo, this is the same attack! CPS is dismantling this national model. Given what we have learned from the past 8 years of school privatization in Chicago, CPS may be planning to “redefine” sojo and turn the school’s state-of-the-art building and its students over to politically connected charter operators. This is all of our fight! 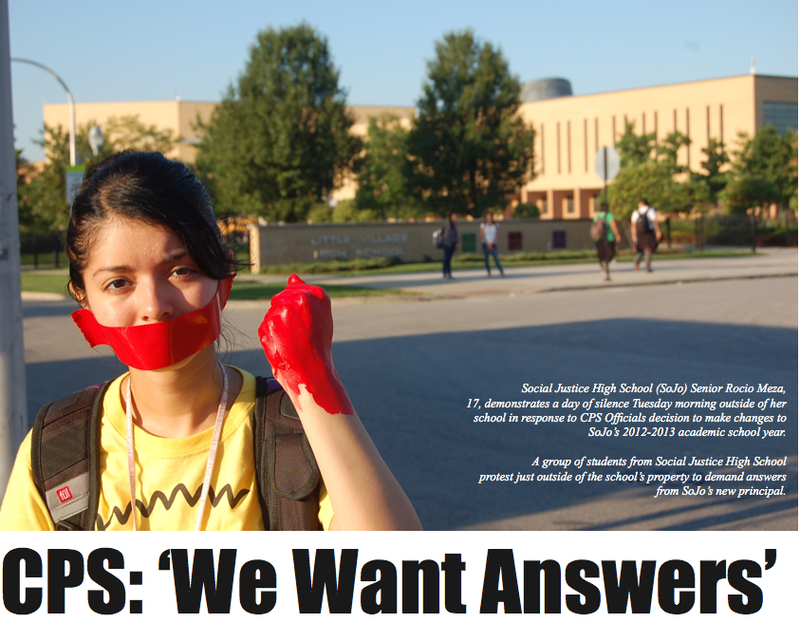 Come out to a community forum on Thurs., Aug. 23, 6 PM (31st St. & Kostner) in solidarity with Sojo. After 17 years of the tyranny of high stakes tests, business-managers running the schools, school closings, disinvestment in neighborhood public schools and turning them over to private operators, teachers have had enough. The 30,000 members of the Chicago Teachers Union are standing up to the bankers and corporate interests who are dismantling public education and destroying teaching and learning. The city that has been the birthplace of corporate “reform” is now the epicenter of the fight against it. Rahm and the CPS negotiators are not budging on key issues: smaller class size, adequate school support staff (nurses, social workers, paraprofessionals), rehiring experienced laid off teachers, and fair compensation. And, in many schools, CPS is not implementing the agreement for a better school day, not just a longer day, as promised. Rahm and the Board of Ed are pushing the teachers toward a strike. Teachers do not want a strike, but they are preparing to do what it takes to win a fair and equitable contract that will help children get the education they deserve and stop CPS from trampling on the rights of teachers. This is a strategic battle for public education. The eyes of the country are on Chicago. The national education privatizers (Stand For Children, Education Reform Now, etc.) 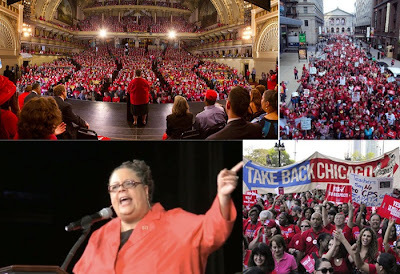 are pouring resources into Chicago to defeat the CTU. We have to mobilize all our grassroots resources against them. PARTICIPATE IN A COMMUNITY FORUM. JOIN THE CHICAGO TEACHERS SOLIDARITY CAMPAIGN. 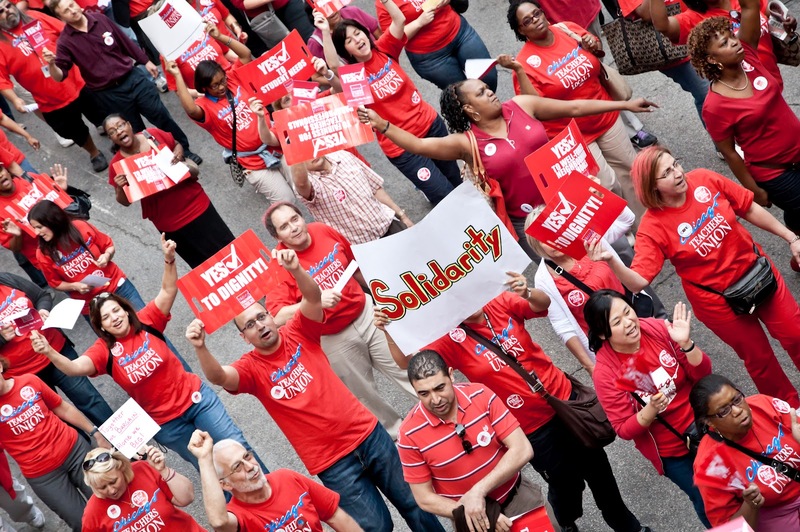 The Chicago Teachers Solidarity Campaign is a diverse coalition of local community organizations, labor activists, parents and students who support the CTU in their fight for quality education. They meet every week and have numerous opportunities for joining with others in supporting the teachers. WATCH THE CTU and TSJ WEBSITES, EMAILS, FACEBOOK FOR UPDATES. TSJ is part of a city-wide coalition – Communities Organized for Democracy in Education (CODE) to win an elected representative school board in Chicago. This is a necessary first step to bring democracy back to public education and to hold those run the schools accountable to the communities they serve. Throughout July and the beginning of August, members of CODE organizations, from Altgeld Gardens, to Rogers Park, to Little Village, to Logan Square, to Bronzeville went door to door gathering peititions for an advisory referendum on the November ballot for an elected representative school board. On August 6 we turned in over 10,000 petitions, in 204 precincts, in 26 wards! This is a powerful beginning for a grassroots diverse citywide coalition fighting for equitable quality education for all our children.